Properly setting up the time variable for the x-axis is crucial to your time series analysis. 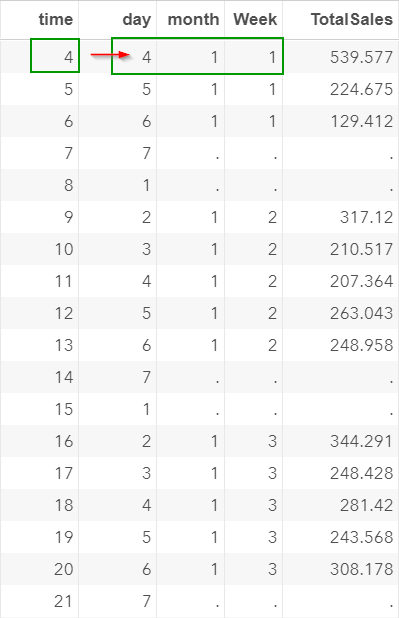 Before we go ahead and create the time variable, let's take a look at how the data is structured. If you scroll down, you will notice that some weeks are missing a day or two. 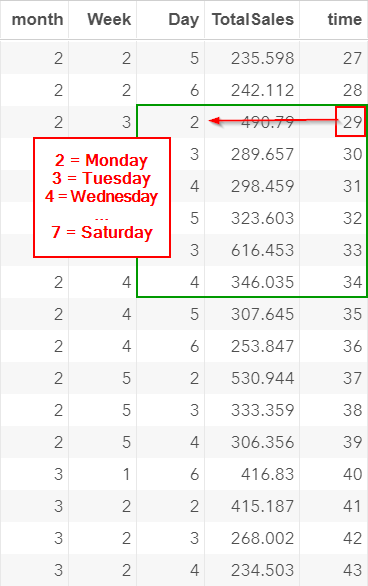 There are only four days in this week. There is no sales record for Friday. 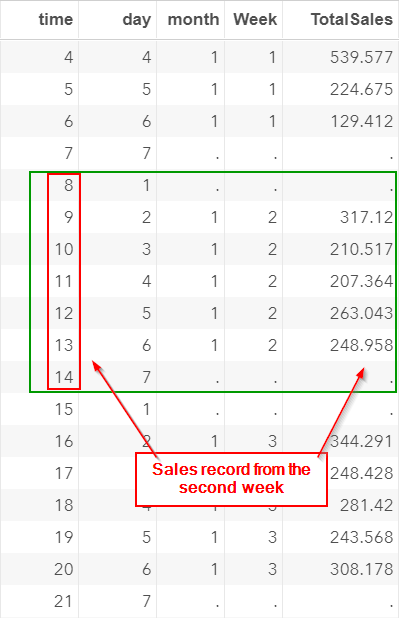 In addition, the following week is missing sales record for Monday as well. The missing records are likely due to holidays. The store is closed and there is no sales record for these days. 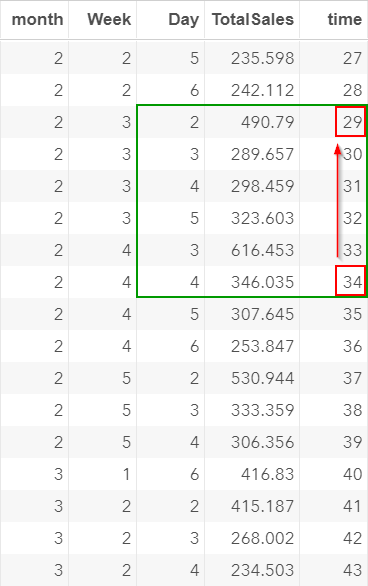 Now, there are a number of ways to create the time variable. ​The simplest way to create the variable is to treat each observation as an independent time point. 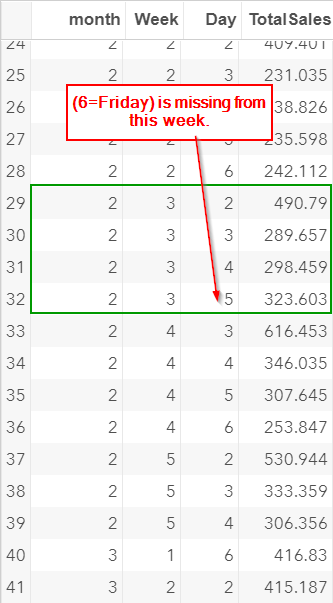 The problem with treating each observation as an individual time point is that the time variable created does not reflect the seasonal pattern of the data. In the previous section, we learned that there is a seasonal spike (i.e. higher sales) on Monday. 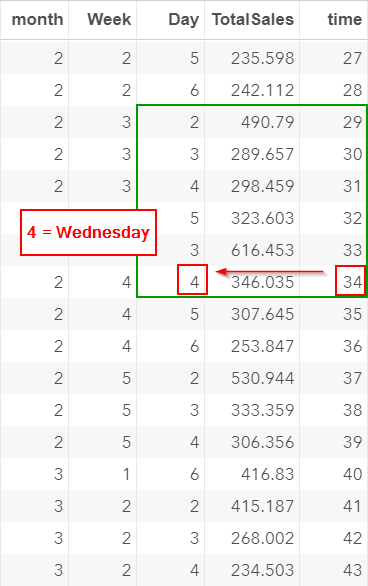 However, due to the missing values, time 34 is actually a Wednesday! Treating each observation as an individual time point changes the seasonal pattern of the data. This will affect the model that we are going to build. 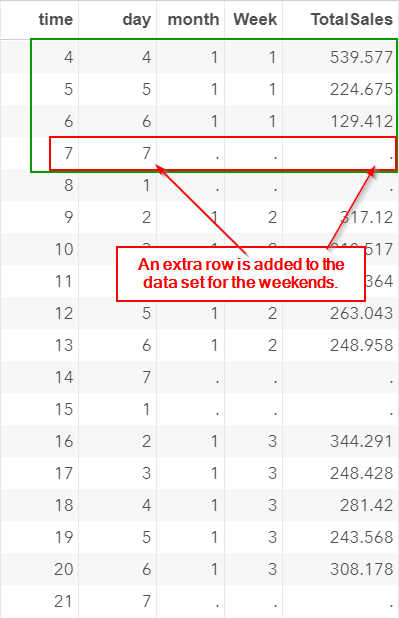 A better way to create the time variable is to create a sequential date column that matches the weekday from (1=Sunday to 7=Saturday). The breakdown of the code can be found here. 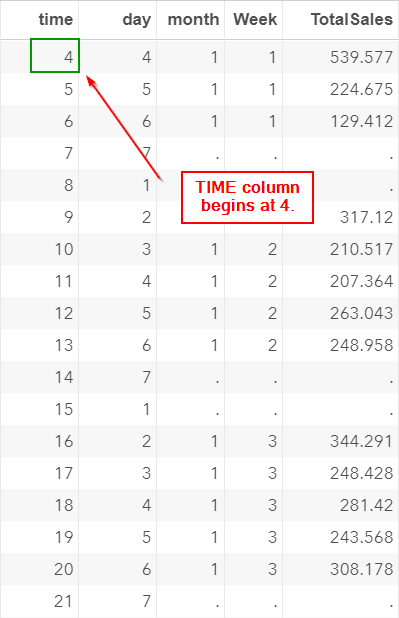 The TIME column created begins at time 4. It corresponds to the time point at Day 4 of the very first week. Data are collected starting on a Wednesday. Note: Saturday is a holiday and the totalsales are set as missing. 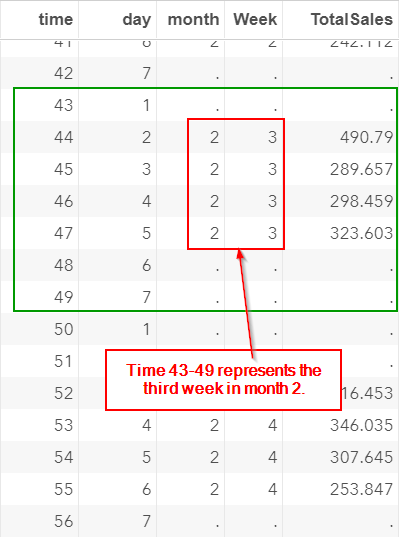 Similarly, time 8-14 represents the second week of the data. 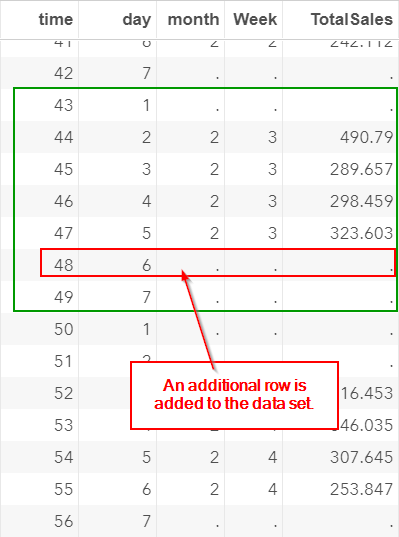 The data set is now structured by weeks of 7 days (except for the very first week). Let's scroll down to the weeks that contain holiday(s). The Friday in this week is a holiday. The store is closed. 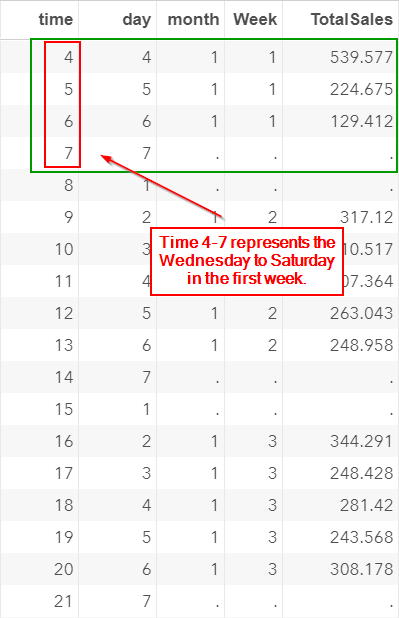 The TIME column is structured in a group of 7 days (except for the very first week). 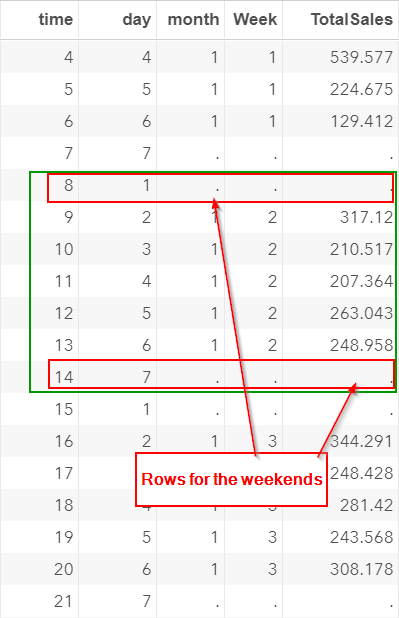 Whether the week contains weekends or holidays, there are 7 rows of data for the week. 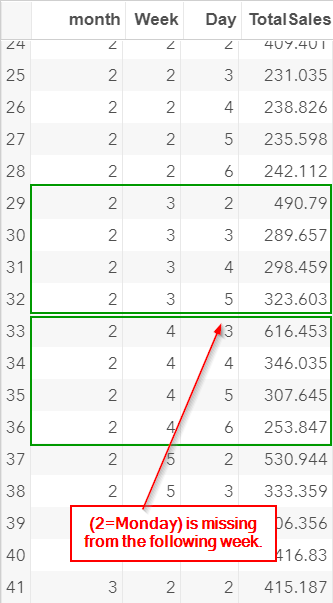 The benefits of creating the TIME column in such a way is that the seasonal pattern can be modeled every seven periods. 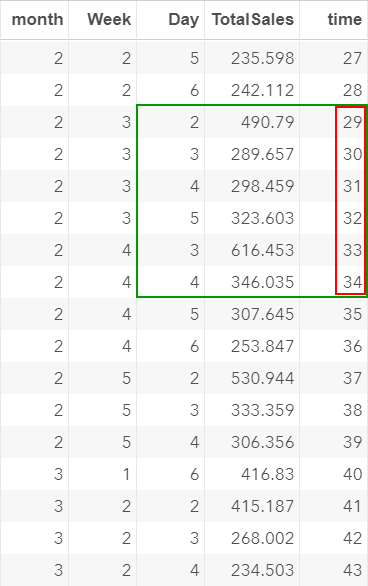 The seasonal pattern is now incorporated into the TIME column. 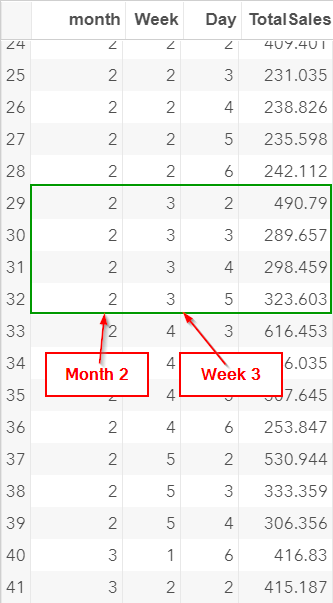 Are there any significant difference in sales between the different week of the month? 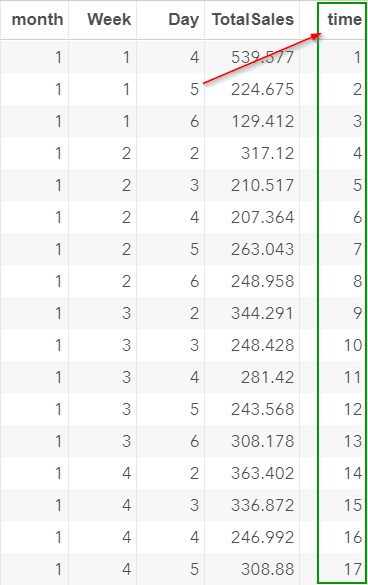 Create a frequency table for the total sales for each week of the month. In addition, fit an ANOVA model and test the difference in sales between five weeks of the month.